Home » Wills & Successions » Will execution – keep it simple by following the statutes. Will execution – keep it simple by following the statutes. Following the statutory basics during will signing can help avoid a challenge to validity when it comes time to open the succession. 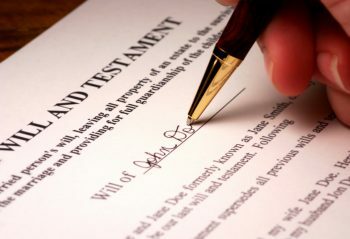 Louisiana currently recognizes two valid forms for a will: (1) the olographic will and (2) the notarial will. La. C.C. art. 1574 A valid olographic will is one that is written, dated and signed (at the end) entirely in the testor’s handwriting. La. C.C. art. 1575. This sounds simple enough, right? Similarly, the notarial will must be prepared in writing and dated. In addition, the notarial will must be executed by the testator, two witnesses and a notary, who all must sign a special declaration, an “attestation clause,” verifying the execution procedure in the presence of each other. La. C.C. art. 1577. However, what happens if the date line on the attestation clause is left blank? Apparently, because the statute does not spell out exactly what happens in that situation, an expensive trip to the courthouse may be required. If you are lucky, like the Holbrook family from St. Tammany Parish discovered the hard way, you may get to spend several years paying lawyers on both sides to get to the answer. See Succession of Hollbrook, 144 So.3d 845, 849 (La. 2014). Up to this point in 2014, wills had been invalidated for technical deficiencies where the day was left out of a date, where blanks were left for the day, month and year of a pre-printed date line in a will and for other reasons with the Supreme Court making clear that “the month, without the day, is no date.” Succession of Holloway, 531 So.2d 431, 433 (La. 1988). However, that all seems to have changed in 2014, with the Hollbrook decision, where the Supreme Court said that despite the fact the day was left blank on the date in the attestation clause, the testament and the attestation clause itself met the “dated” requirement of art. 1577, because the full date was written on each page of the will and before and after the signatures of the attestation clause. The Court pointed out that drafting comments to art. 1577 show the intent of the law was that the date could appear anywhere on the document and did not have to be written in the presence of the notary or witnesses and, in some situations, may not be necessary at the attestation clause. The Court in the Hollbrook decision reasoned that the earlier Holloway case relied on by the lower courts was factually different from the Hollbrook case because in Holloway “there was no complete date found anywhere.” In Hollbrook, however, the document was dated multiple times and on each page with the same date, complied with the form requirements in all other respects and the record otherwise lacked any evidence of fraud in execution of the will. Therefore, the Court reasoned, the omission of the day in the date line of the attestation clause alone was not sufficient to render the will invalid and to do so would elevates form over substance, a concept generally disfavored in the law. Though the Court finally upheld the validity of the will in the Hollbrook case, it may be a good idea to very closely follow the formal, technical requirements for drafting and executing a will to avoid a costly challenge to its validity.